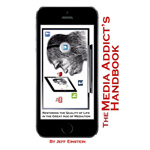 Digital media pioneer Jeff Einstein started writing about media as addiction in 2004. Back then, he observed how our fealties and addictions to the media and digital devices in our lives had already begun to turn against us, like an addiction to any other narcotic. Of course, back then almost everyone thought he was crazy. Today, however, media as addiction is a common topic of discussion on just about every TV and radio talk show – from Bill Moyers to The View. Alarmingly, what Jeff predicted ten years ago has unfolded just as he predicted. 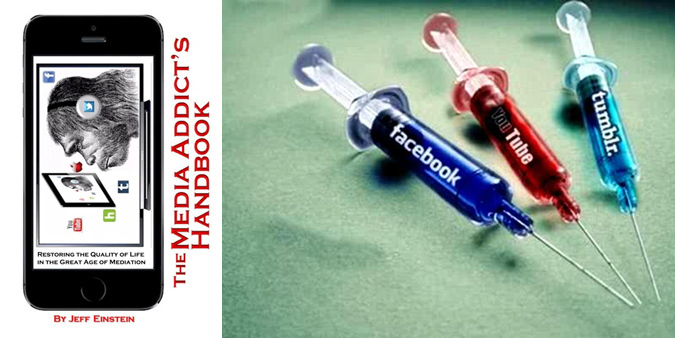 So when I heard about his new title, The Media Addict’s Handbook, I called him on the phone to talk about it. JEFF: Thanks for asking, Jaffer. Yes, I speak at events of all kinds, everything from fund raisers for faith-based organizations and civic groups to corporate seminars and workshops. Anyone interested can contact me directly at 718-598-3744. Jaffer Ali is the CEO of e-commerce company, PulseTV.com. He is a serial entrepreneur who has touched every part of the online ecosystem since 1998. Jaffer is known as a contrarian thought leader who has contributed over 250 essays to industry trades covering every aspect of online media and marketing topics. A collection of his essays can be downloaded for free: Chasing String In The Digital Era.